This page is in memory of Nancy McCue, who passed away peacefully at her home on October 4, 2018. A graduate of the UVA School of Nursing, Nancy practiced at UVA Hospital for many years. She was married for 49 years to Dr. Frank C. McCue III, a nationally recognized orthopedic surgeon who cared for UVA athletes for more than 40 years. When “Doc” treated a wide range of people—from professional athletes to Supreme Court judges to foreign dignitaries and famous actors—Nancy would often care for his patients in her home. She had the difficult job of making sure every athlete from the state was well cared for in the early post-operative phase, especially when the parents of college athletes may not have been able to travel to Charlottesville. Frank preceded her death in 2012. The McCues have long been champions of student athletes and their special healthcare needs. Nancy was the first donor to UVA's new Ivy Mountain Project, a new orthopedic facility that will be an invaluable resource for athletes and community members alike. We ask that gifts in Nancy's memory be made to the Ivy Mountain Project, the only care facility of its kind between New York City and Atlanta. 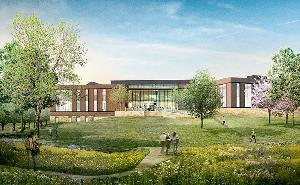 This September, UVA Health System broke ground on an extraordinary new orthopedic and sports medicine facility. This world-class complex will offer nationally-ranked expertise and care found in few other places—all in one easily accessible setting. Complete with walking gardens and outdoor therapeutic spaces, the Ivy Mountain Project will offer on-site diagnosis, imaging, surgery, physical therapy, and rehabilitation. Unique opportunities for ongoing research and education also exist. The new facility will offer same-day joint replacement, as well as expert care in a number of specialties, including hand, spine, sports medicine, foot and ankle, orthopedic trauma, sports concussions, and prosthetics and orthotics.